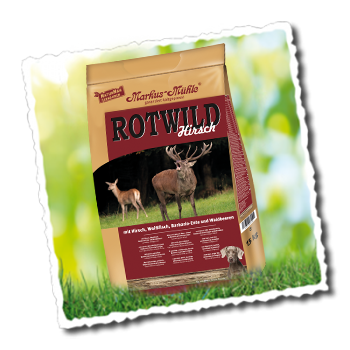 Our recipe consists of red deer, highly digestible duck meat, white fish that is rich in omega fatty acids, and other carefully selected natural ingredients which are made into flavourful pellets in a cold-pressing process that preserves the essential nutrients. Our easily digestible complete dog food in cold-pressed pellet format. The Red Deer recipe with green-lipped mussel extract, silica and a well balanced ratio of omega 3/6, which helps nutritionally to nurture bones and joints and to optimise the metabolism and keeps your dog fit. 6.3 %, ground millet, dried rice germ, gelatine, dried and ground beta vulgaris, dried and ground venison bone, seaweed blend, fresh green herbs, cold-pressed vegetable oil mixture, linseed, dried moor 2 %, forest berries (consisting of: red currents, raspberries, berries, blueberries, rosehips, cranberries) 2 %, fennel seeds, dried and ground Yucca schidigera, egg yolk powder, silica 1.5 %, green-lipped mussel (Perna canaliculus) extract 1.5 %, green mineral soil.